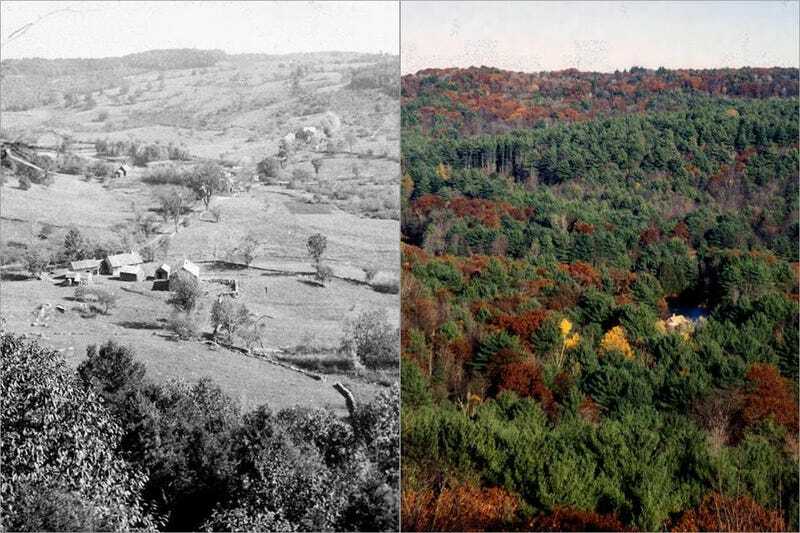 In the nineteenth century, farmers in New England completely destroyed the region's forests. Thick woods were cut down to make way for farms, driving out deer, beavers, owls and bears. But today, just a little over a century later, the forests are back — and the animal populations are recovering too. Today, 80 percent of New England is covered by forest or thick woods. That is a far cry from the mere 30 to 40 percent that remained forested in most parts of the region in the mid-1800s, after early waves of settlers got done with their vast logging, farming, and leveling operations. According to Harvard research, New England is now the most heavily forested region in the United States . . .
Wetlands throb and slither with rejuvenated life. Rivers are quickening even in notoriously compromised corners of the region — the herring run on the Acushnet River in southeastern Massachusetts, for example, has rocketed from a few hundred fish to many thousands. And bald eagles are soaring in skies that have not borne eagles for decades. Chalk it up to taller trees, cleaner water, and plenty of prey, according to biologists.